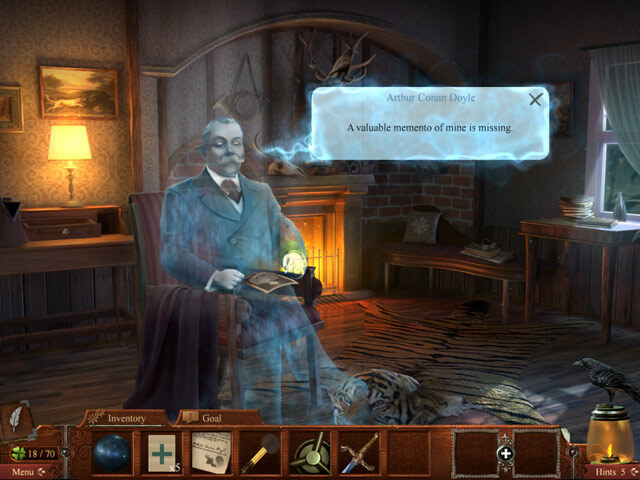 When Houdini’s promises of contact from beyond go unkept, his wife comes to you in a final plea to unravel his mysterious passing in Midnight Mysteries: Haunted Houdini Deluxe! When he promised his wife that he would try to reach her from the afterlife, it was seen as the ultimate stunt. But after years of séances, Bess was never able to reach Harry in this life or the next, and her spirit has come to you in a final plea to reunite her with her partner! Deluxe games include an Integrated Strategy Guide! 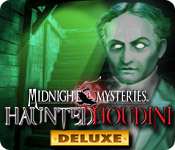 Midnight Mysteries: Haunted Houdini Deluxe is rated 4.4 out of 5 by 232. Rated 5 out of 5 by sapphireblue11 from Quite the Surprise! I haven't played a fun and unique game like this in quite a while. There are surprises that come flying at you around a few corners. The HO scenes are multiple step-which adds to the quality of this gaming experience. The story line is interesting as it has bit of the truth in it relating to Harry Houdini's quirks and his mystery shrouded death. I highly recommend this one! Rated 5 out of 5 by Buriedindream from Rainy weekend fun! The gameplay runs smoothly along, no puzzle to hard to be stuck in any area for too long. The graphics are beautiful, a lot of love has gone into creating this game, turn off the light and you will be taken into the world on your computer screen. Enjoyed the hint system (search for ravens in-game to acquire extra hints) One negative aspect: All the pop text! Monotonous. Cringe worthy, almost enough to make me click the game off after 15 minutes of gameplay. if you can ignore the pop up boxes, you have a great little game! Rated 5 out of 5 by Dargonnoone from One of the best I purchased this game in desperation trying to find a game that would absorb me for a while. It didn't disappoint. Such good value for money. A long game with extra hints to find and clovers to locate in each scene, sometimes two. The storyline was really interesting and a couple of times I nearly fell out of my seat with surprise. Most of the games were unusual.The mechanics were sometimes slightly clunky but I can forgive that for the enjoyment I received. I'm sure that at sometime in the future I will play this game again and again. Rated 5 out of 5 by ahunter0701 from Awesom game!! I loved this game!! Very interactive and great storyline. I loved every one of the puzzles, which normally I skip some that I come across in games. Has features that you would see in a CE. You need to find 40 four leaf clovers, and look for ravens that go towards your hints, the more ravens you find the more hints you have. Loved playing this game, it's a game you could enjoy over and over again. Rated 5 out of 5 by robbieny from I love this series Big Fish has censored me for a word that is totally PG. These games are the best, but apparently that is all I can say. I do actually love this series of games, but I would hate to criticize any other aspect and use a grownup word for fear that Big Fish people might faint and die. Rated 5 out of 5 by MSecaur from My new favorite! A chilling and immersive historical Hidden Object game! I thought it would be hard to find a game to top "The Yellow Room", but "Midnight Mysteries: Haunted Houdini" does! For someone who likes a little history, mystery and adventure mixed into their Hidden Object games, this one could not have been any better. I was entranced from beginning to end, and wouldn't hesitate to say that this is the best game I've ever played from BigFish Games. It just kept getting better and better, and just when I thought that I had reached the end, a new twist was added that kept things going! Despite being the fourth entry in the "Midnight Mysteries" series, I played this one first, and without question it spoiled the others for me. "Houdini" really trumps them all, in every category. The graphics are amazing, the sound effects and music are clear and good quality, and the atmosphere...Well, let's just say this isn't a game you'd want to be playing in a dark house all by yourself! As a self-proclaimed history nut as well as someone who knows Houdini's life story very well, I found the storyline thrilling; and, even though games like this take a certain amount of suspension of disbelief, right up until the final bonus chapter, extremely logical. Until that point I totally believed in everything that was going on. Sure, some of the stuff might be a little unbelievable, but I still really enjoyed how hard the developers worked to keep a level of historical accuracy. How cool is it to be able to interview Sir Arthur Conan Doyle and consort with Bess Houdini? The gameplay was also fantastic. Never have I felt so involved in a computer game. As weird as this sounds, at certain points I became so totally immersed that I literally felt as though I had been transported back in time and were truly investigating the truth behind Houdini's demise. Another bonus for me was the opportunity to perform and be a part of many of Houdini's tricks in several excessively diverting minigames. So for history buffs and magic aficionados alike, this one ticks all the boxes. Not to say that I don't like hidden object games, but sometimes that facet is over-represented to the point of tedium. This game was a refreshing mix of searches, mystery, exploring, history, and clever but not frustrating puzzles that make you think, just how I like it, and that actually go towards furthering the plot, something many HO games drop the ball on. To conclude, if you're looking for an easy, relatively uninvolved game you can finish in an hour, this isn't the one for you. But if you like a longer, more intriguing game that you can really sink your teeth into, than by all means don't pass this one up! Rated 5 out of 5 by JustTheFacts from Marvellous Midnight Mystery! BASED ON COMPLETED GAME FIRST IMPRESSIONS I adore this series, with its unique style in visuals and the complex and compelling stories. I even love the raven. This game differs somewhat from the norm, and is even better than the others (which were all exceptional). It has been released as a “Deluxe” Edition, so the extras – the bling! – you might say, are here at a standard edition price. It’s a great pity that this style of edition didn’t take off. DELUXE BLING! Quite a good package here. There is an in-game Strategy Guide (which is done differently by this developer, and is far easier to see and understand). There are 2 collectibles. The ravens (52) are extra hints, and clovers (40 out of 70 are needed to unlock the unlimited mode). In this extra, you get to revisit HOPs from the game, and find the full list of EVERY item in them. You are rated by time taken, for 3 awards (gold silver bronze). There are also achievements. Not many, but a couple of them are interesting. Clovers can be found all over the place, including HOP scenes, and sometimes are very small and rudimentary. SIGHTS & SOUNDS Beautiful graphics. I love the way these games are put together. I have seen no game ever that has the same look and feel. Cut-scenes, from the very first, are amazing electrifying and occasionally startling. I lost count how many times I jumped and flinched. And I’ve played the half a dozen times! The game really is quite creepy, it’s just that gameplay is so intriguing, I get a little ‘lost to the world’. I also love the convincing details of the widely varying locations and epochs. The music, too, is unique and has a wonderful creepy tone from time to time. I loved the special effects. No voiceovers. WHAT’S HAPPENING Houdini was well known for having a thing about fake mediums and psychics. He debunked a lot of very unhappy people. He made a pact with his wife that if there really was a way to contact the living after his death, he would contact her and they would use a code to make sure it was really him. All this is true, at least, part of the Houdini legend. 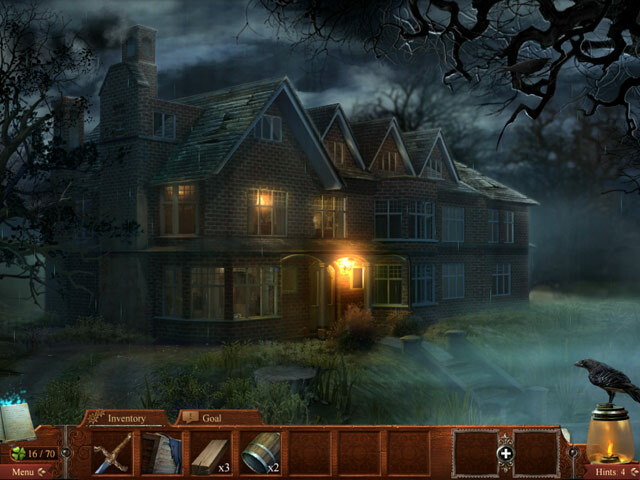 The game starts with Mrs Houdini’s ghost seeking your help to find Harry’s, because even after her own death she has been unable to contact him. The story is, Houdini was murdered, and you must travel through time and space to visit those people who he knew who might want him dead. It is a great departure from the usual fare offered in HOPA’s but still very much in keeping with this series. MAKING PROGRESS An emphasis on HOPs, each an interactive list, and visited twice. Puzzles are okay, there is not too many of them. The adventure part is helped along by a perhaps too helpful hint that tells you exactly what to do next. There is no map. Skip, is pretty slow if you want to give up on those puzzles. CRUX OF THE MATTER I love every Midnight Mystery produced, and this one just gives me goose bumps! Rated 5 out of 5 by wifeofgerry from My current favourite Loved this game, graphics are good and storyline also good. I've got a few of the Midnight Mysteries games and this one is as good as it gets. Mini games are a wee bit different but not too challenging. As well as being interesting to play, it's thought provoking in what might have really happened to Houdini. I will be playing this game again and again.